Notes: Craigcrook Castle is a well-preserved castle in Blackhall, about 3 miles (4.8 km) west of the centre of Edinburgh, Scotland. The castle primarily of the 17th century, though with later additions. In the 19th century it was the home of Francis Jeffrey, Lord Jeffrey, and became known for its literary gatherings. It is a category B listed building. 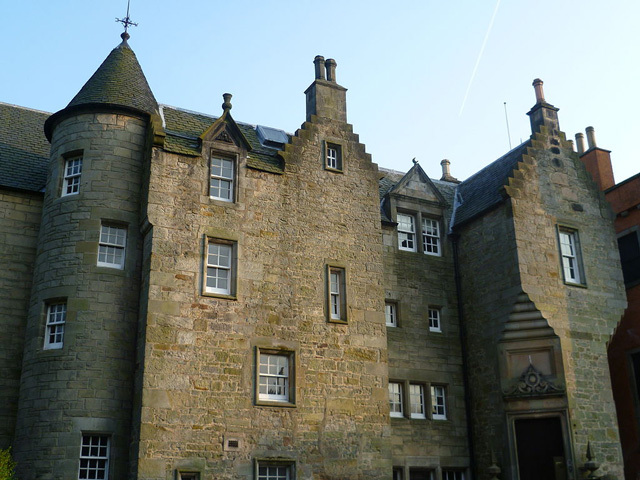 The castle is close to Corstorphine Hill, and was a fine country house convenient for the city. The history of the Parish of Cramond says, "To the S.W. of Drylaw, in a hollow at the foot of Corstorphine Hill, which here makes a turn or crook to the eastward, whence the name is derived, stands Craigcrook, apparently the most antient edifice in the parish". It originated as a Z-plan tower house, but has had numerous additions, with the result that both within and without there is a jumble of styles. There is a round tower on the south west corner, and a square tower to the north east. The main block is about 60 by 20 feet (18.3 by 6.1 m), and three storeys high. The ground floor was formerly vaulted. as is the upper floor of the round tower. The round tower is 20 feet (6.1 m) in diameter. The square tower's sides are 17 feet (5.2 m) long, with the stairs at the south east angle. There is an entrance tower, built by Playfair. The castle has crow-stepped gables and pediment dormer windows. Some of the 19th century interior work of is interest, including murals by David Roberts. A 17th-century wall still encloses the garden which has a roll-moulded arched gateway, the pediment of which is dated 1626.